Fresh - Shopping Organiser has the ability to use your device rear facing (selfie) camera, this can be used with the Continuous scan feature to let you scan products hands free. This feature is very dependent on the device camera and auto-focus features and may not be effective with all devices. 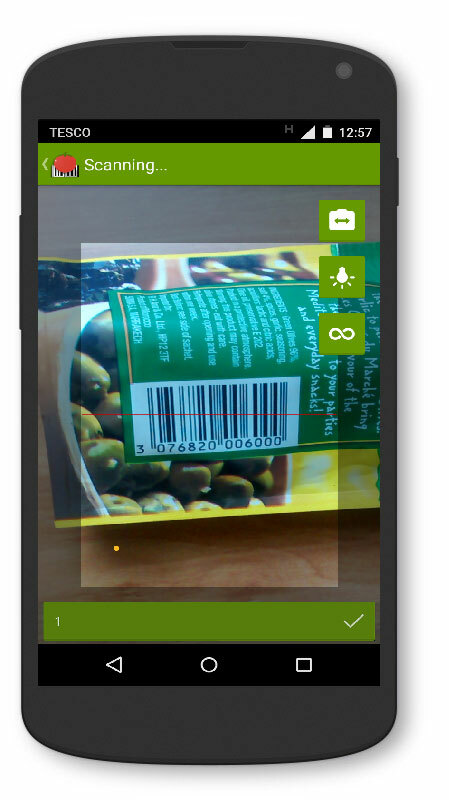 If you have several devices (smartphones or tablets) we suggest you experiment with each device in portrait and landscape modes, using products with a barcode label on a flat surface (e.g. boxes). Tap the Continuous Scan icon and tap the front/rear camera select icon. Place the device facing upwards or on a stand facing you, then hold the product close to the device screen and slowly move away. This can be tricky we suggest practicing with boxes. Cans, bottles and crumpled plastic bags can be extremely difficult. Even lighting is important, avoid strong lighting or shadows across the device's screen. In Continuous scan mode a bar at the bottom displays a count of the number of scans, tap the bar when you have finished.